Huaraz is located at an elevation of approx. 3050 m asl. in the Río Santa Valley - also known as Callejón de Huaylas - embedded between the Cordillera Blanca and the Cordillera Negra. The capital city of the Ancash Region is the home of around 100.000 people and represents an important centre of economy and tourism. All those intending to do smaller or larger hiking trips in the Cordillera Blanca will inevitably start from this place. Huaraz can be reached by bus from Lima within a comfortable and scenic day trip. Like most other hispano-american cities, also this one is characterized by a regularly aligned road system and a central square or plaza. However, the urban landscape differs from cities which are otherwise comparable to Huaraz. This, however, was not always the case. You can explore the centre of Huaraz by clicking on the arrows or in the image. These scenes show the city centre from different perspectives and at different levels of detail - including a morning view over the main road to the snow-clad summits of Huascarán, the reflection of the cathedral in a glass front, and the view from above. What is your impression of Huaraz? Visit also the contributions on Lima, Arequipa, Cusco, Salta, and Mendoza. Which differences to Huaraz can you recognize? 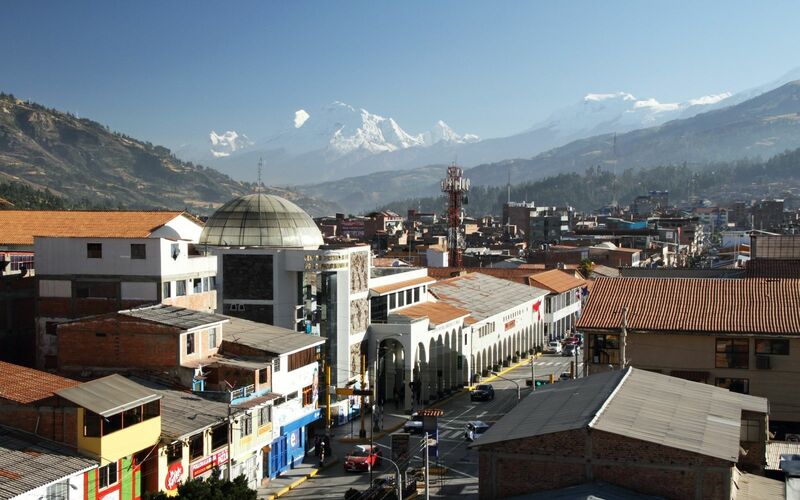 Or is one of these cities even similar to Huaraz? Note the buildings in particular. On 31 Mai 1970, Huaraz was destroyed by an earthquake and had to be almost completely rebuilt. Therefore the city centre appears quite modern, without colonial buildings. Mendoza in Argentina is one of the cities sharing this type of fate. In the contribution on Yungay you can learn about another consequence of the 1970 earthquake. Huaraz was not for the first time hit by a natural disaster in 1970: a debris flood coming out of the Quilcay Valley brought death and destruction to the city in 1941. In the contribution on the Laguna Palcacocha you can learn more about the origin of this flow. The tower of the university offers a comprehensive view over the centre of Huaraz: you can enjoy it by dragging the scene. You can look around by dragging the scene with the left or the right mouse button. This photo shows the main square of Huaraz, an important feature of every hispano-american colonial city. The cathedral can be seen directly at one side of the square. Today, the Plaza de Armas serves as an important social meeting point. You can visit the central squares of other former colonial cities in the contributions on Lima, Santiago de Chile, Arequipa, or Cusco. Somehow all of them are similar, but all the surrounding buildings are new and modern in the case of Huaraz - even the cathedral.